On that day of darkness which most of the earthlings would call night, I had that lone drive to Angamaly which sparked that memory which was recalled and initiated with a cup of tea a few kilometres from the destination. For something which was powered by tea, there was surely the memory which consisted of the immortal drink of the common man, but the town remained the topic of that night; that time, it was about the destination and not tea, the latter which served only as the path – the motivator. Supported by a number of English songs which served as the gasoline for that moment, those which were to point directly to some random destination in England or Scotland, they actually led to that place, as the compass showed one direction and the memories followed to travel and reach that place which was a lot closer; but memories needed no petroleum products. That journey was something which happened a few years ago and after reaching Angamaly, the first thing to notice was surely the St. George Basilica with its dome giving a great sight from a distance adding a certain amount of magnificience while entering the town from this side of the National Highway, which is the path coming from the Cochin side, while St. Joseph’s Church would catch the attention faster from the other side, with its own dome is definitely a closer thing to the road. The former and the latter should be that noticeable; new and closer to giving a great sight to the human eye, and may be also to the eyes of the angels of the other world who travel beyond the dimensions; at the same time driving the demons of Hell away, with its own uncrowned champion getting the worst of the creatures made of clay, due to their devotion which could make the power of hellfire submit. The Basilica might be one of the biggest churches in India, if not the largest the biggest of the newer church structures of this century located at this part of the world. At Angamaly, which has been one of the main centres of Christianity in its early days, stands this church building which is a thing of beauty as well as spirituality. Its architectural beauty could take no second seat as it looked that awesome, even if it lacked the usual old-style characteristic which could have lead the mind to another world, for it would have suited the land better; still what the new structure gave was no thing of less importance in a world of no devotion, belief or faith to guide humanity in the right path. It can be for this world or the other, but it would serve, and as John Milton would say, stand still and serve like a few angels who successfully avoided the temptation of the fallen one who spoiled that wonderful opportunity to serve at the right place rather than to rule at the wrong place. When looked from the outside, its the dome and the two towers of the front which might gain all the attention, but once inside, the window glasses steal both the heart and the brain. They are so beautiful and when the light passes through them, there is more of that divine feeling added to that already existing beauty and the feeling is more of being out of this world. The windows keep reflecting the light to the floor and the feeling of divinity continues to reach another level. One can look at all sides, upwards, downwards and everywhere there is that great feeling of beauty which exists throughout the structure with its spirituality. It is that domain of prayer which is not just a material thing, but something which would continuously touch the inner soul; raises that faith and belief, calls one’s spirit to that new dimension of never ending hope. St. Joseph’s Church of Karayamparambu should be something new. It is easily visible from the side of the National Highway and is mostly one huge dome and not that huge a structure as it seem to be. 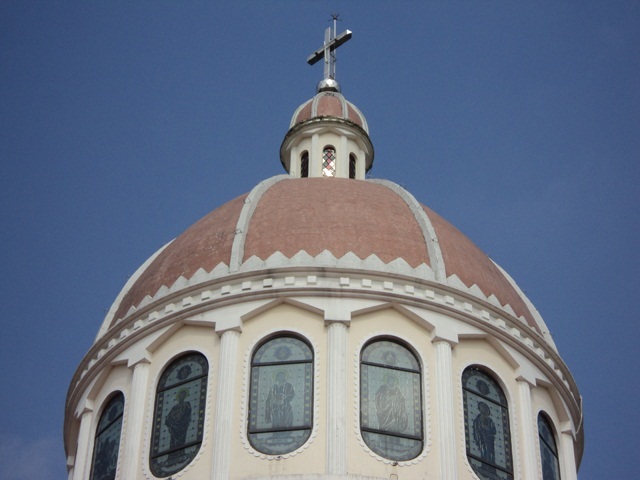 The dome comes at the front area of the church building and it gives the structure a great view, along with those statues of the saints adorning the area just below the dome, supported in beauty by the cherubs on the front gate. Inside the dome, there are the pictures of various saints as well as those of various incidents in the Bible. The altar is also very much something of beauty and the feeling inside continues to be great. There is nothing in there not to be noticed, and being a smaller structure doesn’t take anything out of it. There is also the greenery not too far away from the location of the church, not planning to leave the beauty just to its architecture. Located so close to the Cochin Airport at Nedumbassery and having its own railway station, along with having one of the best bus stations around, Angamaly is surely fast developing and in that process, it would add more to the memories which are to be awakened by another night ride, next time that ride itself would be a memory which would stay alive for a longer amount of time, not to haunt and not confuse, just to provide enough to keep them steady in the mind, as it would deserve as that town of importance, located that close to those pilgrim centres of supreme importance, Malayattoor and Kalady; for it is that gateway and it can only be extended and get better. The memories also would have the same opportunity, and it is for them to take and use during one of those journeys and fill the mind with them without an opportunity to overflow.